Day 20 is watermarble nails. I think everyone who does their nails fear the dreaded watermarble manicure at one point or another. I was totally dreading doing these before I even started the challenge. Today, I think I might have broken my fear of watermarbling because they turned out AMAZING! I don't know if I just got lucky or what, but these are awesome and I'm really proud of them. For these watermarble nails, you'll need some tape, a dotting tool or toothpick, and some room temperature water. I used bottled water for mine, but you can use distilled water and room temperature tap water as well. It's best to get out all your materials first so you're not getting them all together while doing your nails. First, I painted my nails one coat of Wet n Wild's French White Creme. Once the base color dried, I poured some water in a cup (an old cup or container will do). Next, I put tape around my nails to make it easier to clean up. You can use Vaseline as well if you don't have tape. Once the nail is taped up, I put a drop of each color into the water. It'll make a bullseye pattern when you're finished. With a small dotting tool (preferably the smallest one as it has a point to it), I lightly dragged it across the polish. Next, I dipped my finger into the polish. To make it easier, I curved my finger a little so I could get the polish right on the nail. To get rid of the excess polish, I used an old pencil (you can use a toothpick as well) and twirled it around so that the polish would get on the pencil. Finally, I took my finger out of the water, took the tape off, and cleaned up around the nail using some Q-tips or a cleanup brush dipped in nail polish remover. You can add a top coat as well, but mine started to bubble and ate up the polish a bit as you can see in the photos. It might be my top coat, but I'm not too sure. 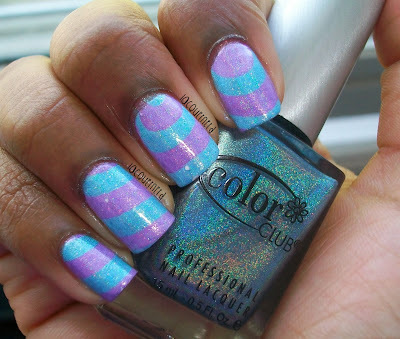 These Color Club Halo Hues polishes were great to work with for the watermarble. I'm not sure if all the Color Club polishes are like this when it comes to watermarbling, but these were great. I'm definitely not afraid of doing watermarble nails now. They take a lot of work, but I can do them. This is my third attempt at them, so I guess third times a charm! What do you think of this design? Tomorrow is inspired by a color! 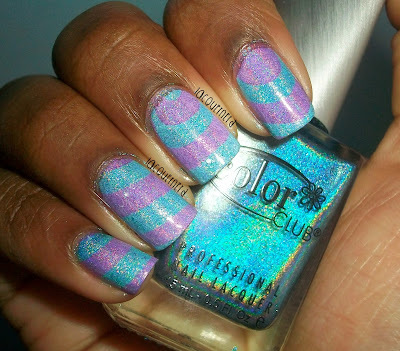 These look very fun :) I haven't seen anyone use holo polishes for water marbling before, it looks amazing! Thank you! I was surprised they came out that good lol. The holo polishes were actually great to work with ^^.